A number of years ago, I registered for Toastmasters, a program designed to help me become a better public speaker. As the owner of a yoga and meditation studio, I was at ease talking to large groups of people about my discipline. So I was surprised to see a new side of me as I stood at a podium in front of a group of strangers to deliver my first prepared speech. A straightjacket of paralysing fear descended. My heart began to pound, my mouth got dry and my hands started to sweat. I was knee-deep in unexplored territory. I called upon all I had to deliver that first speech. When I finished and I heard applause, I felt enormous relief and a great sense of satisfaction for having pushed through my physical and mental discomfort. Fear is an emotional and physiological response to a perceived threat. Often, fear makes us want to hide, run away, or to freeze in our shoes. Courage occurs in the moment we choose to wriggle out of the straightjacket of fear and stand in the space that is unknown. The word “courage” has its roots in the old Norman French, “coeur”, or “heart”. To have courage means connecting deeply to the wisdom of the heart to confront our fears, aversions, doubts, timidity, apprehensions and dread. Many of us associate courage with physical acts of heroism ― diving into deep waters to save drowning children, rushing into licking flames to rescue family members from burning houses, and fending off grizzly bear attacks. But in addition to outward displays of heroism, courage appears in quiet acts. Courage is with the woman who escapes a bad marriage. It is with the boy who risks rejection by crossing the floor to ask a girl to dance with him. It is with the woman who calls up an old friend to ask why she no longer talks to her. It is with the man who leaves the security of a full-time job and a regular pay cheque to open his own business. Courage also informs how we live our lives and the values that we hold dear. When I think about courage I draw inspiration from so many ordinary and extraordinary people throughout history. I think about the women and men behind the #Me Too Movement who came forward to shine a light on sexual predators in the entertainment industry. I think about the students of Stoneman Douglas High School in Florida who lived through a horrendous mass shooting and were unwavering in standing up to the politicians and the National Rifle Association. I think about Jonathan Pitre, the local teenager who lived with a rare and painful skin disease, yet who displayed strength of character, resilience and joy, day after day. I think about Rosa Parks, the American activist who in 1955 in Montgomery, Alabama, refused to obey the bus driver`s order to give up her seat in the “colored section” to a white passenger, after the whites-only section was filled. 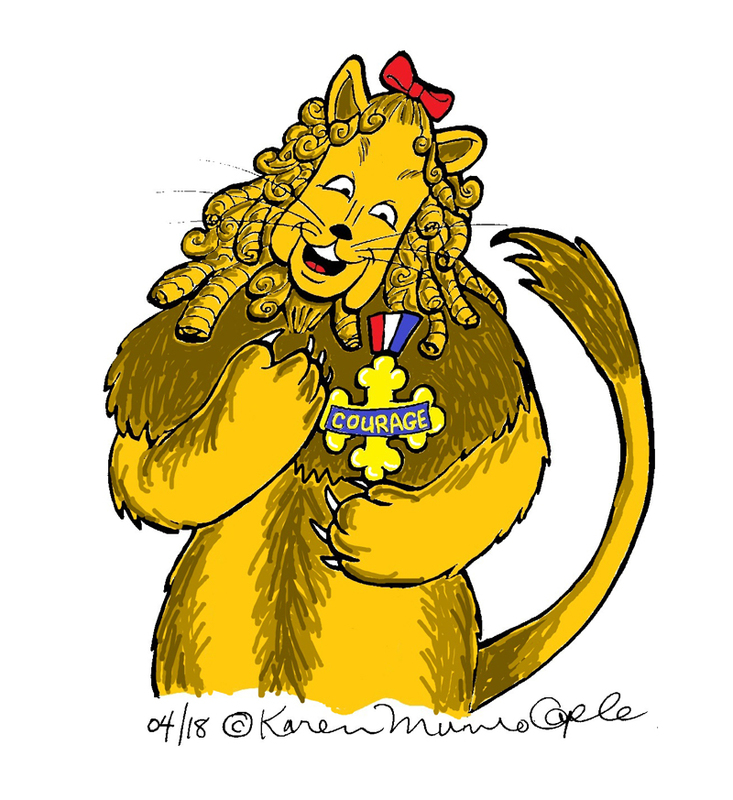 And who can forget the beloved Cowardly Lion from the 1939 movie, The Wizard of Oz who did not recognize his innate courage until the Wizard brought it to his attention and made him a member of the Legion of Courage. Courage is like a muscle. The more you exercise it the stronger it becomes. –	What did you do? –	How did you feel doing it? –	What has changed for you in following through?